Thomas Austin, a bad idea and rabbits…..
History is littered with bad decisions. For example, Louis XVI’s decision to support the revolt of the British Colonies in America. This worked out well for what soon became the United States of America but not so well for him. The ideas fostered in the newly formed United States of America, or inspired by European philosophers, led directly to the French Revolution and cost Louis XVI his head, literally. Then there was the U.S. Army’s decision to line up six divisions and have them watch from a few miles away an atomic bomb going off. Let’s also not forget the engineer who decided to use that nice, shiny, and flammable aluminium paint on the Zeppelin Hindenburg. Rabbits were introduced modestly to the continent of Australia when it became a dumping ground for British convicts in the eighteenth century. The First Fleet’s manifest in 1788 included one stallion, three mares, three colts, two bulls, five cows, twenty-nine sheep, nineteen goats, forty-nine hogs, twenty-five pigs, eighteen turkeys, twenty-nine geese, thirty-five ducks, one hundred twenty-two fowls, eighty-seven chickens — and five rabbits. More were brought to Sydney in 1791 aboard the Gorgon via South Africa, and others no doubt came in that have since gone unaccounted for. These and other rabbits that were imported did not cause any major difficulties — at first. In the early part of the nineteenth century, rabbits were introduced to New South Wales, Tasmania, and even to their own island — a small island off Wilson’s Promontory was dubbed Rabbit Island since, according to accounts, two black-furred rabbits were left there by what one sailor called “a praiseworthy sealer,” and proceeded to overrun the island. By 1846, according to one account, whalers used to go to Rabbit Island for sport and food. Attempts were even made to breed them. The dam broke in December 1859, thanks to an English tenant farmer named Thomas Austin of Barwon Park, Winchelsea, near Geelong. Austin had made a fortune in Australia and wished to have hunts in his new home, as did several of his fellow members of the upper crust. He would not lower himself to using the nearby Tasmanian rabbits, nor any of the other local strains that had been developed in the last seventy years. Instead, he wrote to his brother and had him send down seventy-two partridges, five hares, and twenty-four English wild rabbits. Austin’s hunting parties proved immensely popular to the British men who were starved for “proper” hunts. The first hunting party took place on Christmas Day, 1859, which was somewhat appropriate, since releasing those twenty-four rabbits proved to be a perpetual “gift” to the Australian ecosystem. The initial two dozen bred like mad. In 1867, The Field reported a kill near Barwon Park of over fourteen thousand rabbits, all descendants of those first two dozen. That same year, in a move that caused no end of hindsight-induced wincing, Austin was awarded a medal by the Acclimatisation Society for his successful introduction of the rabbit to Australia. “Successful,” in this case, is a relative term. Rabbits have no natural predator in Australia, nor were there any local diseases that would claim them. Australia being an island, no such diseases were likely to be introduced. Meanwhile, they ate any greenery they could sink their teeth into, often at the expense of the native sheep, cattle, and other livestock. 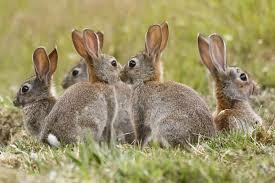 They bred like, well, rabbits, and soon Australia was covered in a grey, furry carpet. Austin was not the only one not to think through the consequences. In 1854, Albrecht Feez of New England, New South Wales, turned out rabbits he had with him because no one would buy them. By 1865, he had been advised never to appear in New England again, as his rabbits had multiplied such that they were destroying the best land in the area. The spread of the rabbits was as much due to lethargy as anything. The traditional methods of restraining livestock, wire fencing or stone walls, proved woefully ineffective; the rabbits would simply climb the fence or dig underneath. The only effective means — for example, six-foot-high walls and trenches lined with broken glass and sharp metal — were prohibitively expensive. Many locals welcomed the rabbits at first. In 1866, landowners begged the government to legislate to protect the rabbits, as they were being attacked by those who disliked having their crops eaten by rampaging hordes of bunnies. By 1872, those same landowners were begging even more fervently for legislation to make the destruction of rabbits compulsory. By the turn of the century, extraordinary measures were required. In 1907, the Western Australian No. 1 Rabbit Proof Fence was completed. It stretched over eleven hundred miles — a distance twice the length of Great Britain — from Starvation Boat Harbour on the south coast to a point near Cape Keraudren on the northwest coast. Guarded by riders on camels, the fence was constructed in an attempt to prevent the rabbits from literally eating their way across Australia. Unfortunately, such a massive fence proved impossible to maintain, and it proved ultimately ineffective. Every attempt was made to control the rabbit plague — for they were now considered such — whether by gun, trap, poison, or attack by ferret, but nothing worked for long or in any practically useful numbers. The government offered a reward of twenty-five thousand pounds to anyone who could come up with a solution. Sadly, this mostly brought out the greedy fanatics. In the 1890S, a gentleman named W. Rodier had tried a wonderfully odd sort of eugenics program in which he would kill only does, leaving the bucks alive, on the theory that the smaller supply of females would force the males to gang up on them and make them less likely to reproduce. Years of failure for this to in any way change things did not deter Rodier, who fervently believed in his disastrous system until he died in the 1930`s. Adrian Loir, the nephew of the famous Dr. Louis Pasteur, suggested spreading a chicken cholera among the rabbits; chicken farmers pointed out the obvious danger to their chickens in such a solution. A strain of myxomatosis was discovered to be killing rabbits in California in the 1930S. Dame Jean Macnamara attempted to introduce myxomatosis to Australia, which met with surprising resistance and difficulty, though a program of infection finally came to pass. By 1959, the hundredth anniversary of Austin’s ill-advised importing, the myxomatosis had severely curtailed the rabbit population, but it turned out to be only a temporary solution, as the rabbits eventually developed an immunity. In the mid-1990S, a Rabbit Calicivirus Disease was launched, which dropped the rabbit populations in the more arid parts of Australia by 95 percent. It is still only a partial measure, but a necessary one. In 2007, rabbits cost Australia over $1 billion per year. Each attempt to curtail the rabbit infestation seems only to slow them down briefly. Thomas Austin’s desire for hunting game has reduced an entire continent to an island full of Elmer Fudds continually confounded by a rampaging horde of priapistic Bugs Bunnies. Next PostMartin Luther – Constipated hypocrite……..